After a few more cups of coffee and some thought, I've returned the cell phone booster. Here's why: in order to get the better reception it provides, I'd have to spend about another $100 on cables and connectors. That would bring the total cost to about $250. The benefit would be a stronger cell signal in areas where the signal is present, but weak. That's real, particularly if I were doing business from the Beast or for whatever reason really needed internet/cell connectivity. But I was out of cell-phone touch for several says at a time on the New Mexico trip, and the world didn't end. The worst was that I didn't have music to stream. The more serious problem in being out of touch is if Something Happens. Something Bad: Broken limb; heart attack; stroke; bear attack. Now in the worst of these cases, it's simply game over. The heart stops, and that's that. Not, all things considered, a bad way to go, in the abstract. Cell phones are a way to stay in touch, to reassure people that I'm OK, not to worry if I'm a day or so late. And to get help when I need it. There's another option here. Satellite communicators. A full-fledged sat phone costs on the order of $1000 plus usage fees. 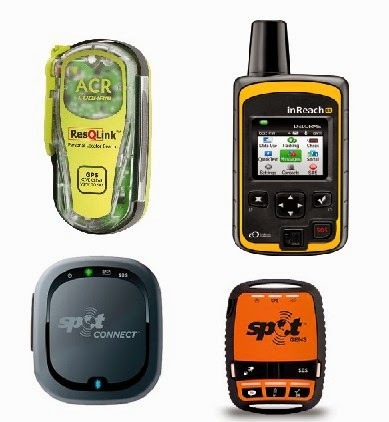 But there's an intermediate satellite technology called "Personal Locator Beacons." I spent some time digesting this review of the technology; here's the short take. At one end there's a military-grade communicator which basically has a big red HELP button; press this, and the guys in the helicopter show up. It has no other function, but it does that pretty well. No annual fees. This is the "I broke my leg skiing in the backcountry" device. Then there are a few other devices which use different satellite technologies and are basically stay-in-touch devices. Variously, they can send (and receive!) SMS text messages, as well as trigger an SOS function. They can have interfaces to Google Maps so your route can be seen by others. They cost about the same as the "true" ELB (Emergency Locator Beacon), they do more, they have annual subscription costs, and they aren't as reliable at getting a message up to the satellite. Tradeoffs. So I'm sniffing at this technology. The two contenders are from DeLorme and SPOT. In the mean time, the cell phone booster is on its way back. It's been quiet here in blog-land. I haven't been writing that much, and (surprise!) people haven't been visiting that much. I'm turning the corner from recovering from the last trip to launching the next, and what I have posted has been about my plans for that foray. I did report that Buck's took care of the leaking seal on the differential. I didn't report what I did about the issue of the leaky kitchen sink faucet: Access to the underside of the faucet is close to impossible. I'd have to take out a good bit of cabinet work under the sink to make space for my shoulders to get in there. So once again, I punted: I tightened the fitting on the gooseneck faucet, and if I do that, the oozing leak seems to stop. It's a nuisance, to say the least, but I'll see how it goes on the Wyoming trip and if all else fails I'll take it in to Merrigan's when I get back and throw money at the problem. This next trip will be the longest I've lived in the rig continuously, and I've been thinking about comfort in daily living. I've been using the bathtub as a storage bin for awkwardly-shaped things, and decided that if I'm going to be staying at campgrounds with water, I'd like to be able to use the shower from time to time! So I took an inventory of the available storage in the rig, underneath and and in the main space. I won't burden you with the details of what's where. But I did make some decisions. One involves the electric bike. I repaired and replaced the damage from the attempt to steal it, and it's back in running shape again. But the fact is that I simply haven't been using it when traveling. So this next trip I'm leaving it behind, and I'm putting a storage "rack" on the rear hitch fitting where the bike rack has been. The extra storage will be a place for some of the things I've been putting in the bath tub and the closet. There's a major security issue back there: the rack myself can be locked in place pretty securely; the problem may lie in what I carry on the rack. Given that there is no such thing as complete security, my plan is to (1) put things back there which aren't all that attractive to a thief: the armload of firewood, for example, which is currently taking up a lockable storage bin, and (2) things which wouldn't cost all that much to replace: bottles of oil, brake fluid, and coleman fuel for the little grill and the space heater. People steal the damnedest things, but in the style of travel I currently anticipate, I won't be leaving the rig behind while I go off elsewhere much. I think I can secure things on a rack so that when it's parked (for example) in a lot at a life dwelling site, it'll be out in plain sight and require a fair amount of effort to steal something. We'll see. About the bike: I'm considering getting a small hitch put on my small car so that I can transport the thing around town, to various bike paths, for example. And if that doesn't turn out to be something that I actually do, I'll sigh a deep sigh and put it up for sale on Craigslist. I got a little folding table to use when I'm seated outside. This will let me leave the bigger folding "workbench" table at home, and thus out of the bathtub when I travel. I added to my supply of cam straps so the lightweight stepladder can travel securely lashed to the built-in ladder on the back of the rig. I got a replacement for the 1999 OEM "city water" connector on the side of the rig. I got a cool little LED-powered headlamp. And probably my biggest "upgrade" was a cell phone signal booster: Not for use while I'm traveling, but when I'm camped. We'll see about this: it requires an external antenna, and the cabling for that may cost almost as much as the unit itself. Bob Wells swears by this unit, and Bob is Van-dwelling God, so this is an act of faith. Of sorts. I'm figuring about 3 weeks for the itinerary sketched in the previous post. This schedule, or something like it, divides data, cash, and credit expenses between two periods. Mileage would total something like 2700 miles: at 9 miles/gal and $2.50/gal that'd be $750 in gas. Camping fees at $10 (high) per night for 15 nights would be $150. Food etc would be as at home, but probably a bit less, based on last trip's experience. Nothing firm about this except the overall shape. I've stayed before at Willow Springs, Fire Rock, and Dolores. The others are place-holders: they're about the right distance apart, but that's it. As you can tell, I'm trying to drive no more than about 4 hours in a day. That should work for the outbound leg, but I know myself well enough to know that when my sights are on home, I tend to head for the barn in a hurry. I've got the next trip sketched out now. Wander north for a lotta miles and more than a week through Arizona, New Mexico, Utah and Wyoming. At this point the turning-around point may be the Bear Lodge Resort up in the Big Horn mountains outside of Sheridan, WY. From there, back south and a bit east to see family in Boulder, and then home. I'm guessing this is about a three-week jaunt. When? It may be a few weeks before I can take off. I'm guessing that the earliest I can leave here is sometime early in the week of May 10. Probably later than that. I'm feeling good about the RV: gotta do something about the sink faucet, but other than that it's in good shape. I'm not going to try to make this into a travelogue. If I tell you I'm going through White Sands National Monument, for example, you can get more information and better pictures than I can take with just a few clicks or taps. That's not to say there won't be any pictures and/or short videos, but the story here will mostly be words. I can do words reasonably quickly and well, and words burn less of my data allotment than more visual stuff. As I've said before, I'm not out to monetize this blog or try to pay for travel expenses this way. I'm not trying to create a "brand" for my "channel." This is more a way for me to keep in touch with family and extended family so y'all know that I'm still alive and what I'm up to. Today I really have to crawl under the sink and see what to do about the faucet. Really. Maybe that will be worth a picture! That fluid leak? A defective pinion seal. The hot smell? Differential fluid hitting the exhaust system. Replaced the seal, refill differential, clean exhaust system. No charge. The rig is in the shop, the detritus from the New Mexico trip is taken care of, and I have a good book going. So the tempo is pretty slow right now. That's a good thing, but I do sense some distinctly itchy feet. The night before I left on the last trip, I discovered that someone had cut the cable which locks the bike to its travel rack. I put up a picture in this post. I picked up the pieces, wondered what had happened, and hit the road. The trip to the shop is because I noticed a fluid leak under the rig in the vicinity of the rear axle. I wondered if this was from the leaky kitchen sink faucet, but no: it looked, smelled and felt oily and automotive. I'd had the differential rebuilt before the last trip, so maybe this was fallout from that job. Buck has had the rig for a couple of days, now, with no word. I'm trying not to worry about expense. Whatever it is, it can be fixed. The leaky faucet is next. Here's another version. A little less northward, maybe more time to explore Wyoming. I just ordered a couple of books of maps. One is a 2014 Rand McNally road atlas. And another is the Wyoming book from a series of road and recreation atlases by Benchmark. I really enjoyed poring over the dead-tree New Mexico map I got for free somewhere on the last trip. And it's pretty useful to be able to plan a few days ahead even if you don't have internet where you're camped. Besides, maps are inherently cool. And I promise to remember that the map is not the territory, as Korzybski reminded us! This is a preliminary sketch -- I think I'd try to find alternatives to at least some of the freeway travel, but Google Maps has to be coerced into "scenic byways." This would be about twice the miles of the trip I just did. I'm drawn to get North... that was the reason I first considered getting an RV. But one of the things I learned last trip was that I prefer staying 2-3 days in one place, and that 4-5 hours of driving is about as much as I want to do per day. This would take me into the heart of western summer tourist country. Not sure how I feel about that. I think I'd wind up looking for more boondock sites... the kind of campground I enjoyed last trip may be pretty well filled up. Camping costs totaled $84... an average of $7 per night. Forest service ($7.50/night) and BLM ($9/night) camp fees were reduced by 50% because of my senior discount. I stayed 3 nights with friends and 1 night dry camping in a parking lot. Food costs, groceries and eating out, totaled $309.34. I brought home a lot of the groceries I bought at my last shopping trip at Walmart in Deming. So total outlay for 13 days on the road was about $660. 13 days of my regular "household" expenses at home would have cost, on average, $400. Got in mid-afternoon. Horrific traffic the last few miles on AZ77. Unloaded most of the rig. The rest will wait until tomorrow. Emma is home, and my friend Stephen, who'd been dog-sitting, welcomed me home with three dinners of yummy, healthy stuff. I'll attempt some kind of summary tomorrow. Maybe. I'm parked beside the road just S of Globe. The Beast and I both needed a break from climbing up and out of the Salt River Canyon on AZ 77. If I'd followed my original plan, I'd have been camped up in the mountains when that came down last night. Pretty, but brrrr! Not to mention slickery driving down the other side. Home in a couple of hours. Last leg -- I think! The railroad runs roughly E-W over there. The freeway run parallel over there. In between is the Navajo-owned FireRock casino, with a huge level well-lit parking lot with regular security patrols. Friendly security people who suggest where to park. A regular shuttle to take you over to the main casino building. For parking lot boondocking it doesn't get any better than this. That's where I am, getting ready to head out for Tucson via Holbrook and Show Low and Globe. It'll be a long drive -- I'm guessing about 7 hours -- but I'm in no hurry. Google estimates about 6 hours, but I'll stop more frequently and won't be running as fast on the I-40 segment as they assume. I walked over to the casino. It's like a casino. Had dinner there... I figured I'd put a little money into the tribal coffers as a thank-you, even though I have a well-stocked larder in the Beast. Food was adequate. Sweet two-spirited young server. The trains and the traffic noise faded into the background and I slept like a log. Eating morning oatmeal as I type, then on the road. Should be there by mid-afternoon. The excitement of heading out is one thing; the excitement of heading home is another. Both are very real. It's been a good trip. I've made a couple of decisions. One is to skip the event in Flagstaff this weekend, and the other is not to head up to Fenton Lake from here. So after I pick up here, I'll start a slow meander toward Tucson. Kitchen Angels is a not for profit home delivered meal program serving the greater Santa Fe area. Our mission is to provide free, freshly prepared and nourishing meals to homebound individuals living with chronic, life threatening or terminal illnesses. Kitchen Angels was founded in 1992. After the volunteer time at Kitchen Angels, it was time for a margarita in the bar at La Posada, La Fonda, and dinner at Andiamo! This is all a far cry from camping on a windy ridge overlooking a lava flow. It seems like I unloaded half the contents of the RV into the house here in White Rock. So this morning I'll gather it all up and batten things down for travel again. 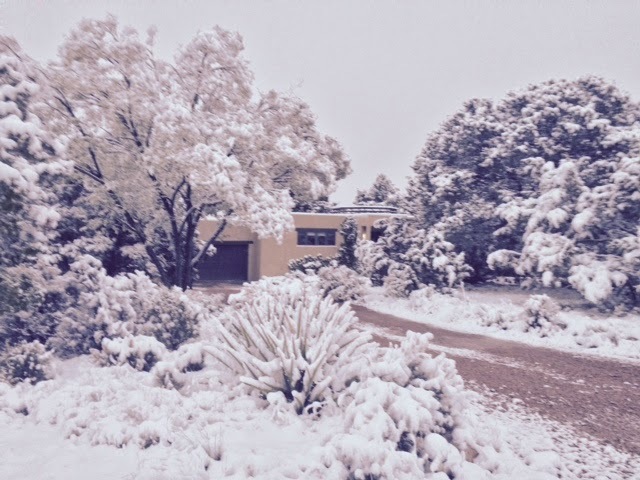 I'm guessing I'll wind up home in Tucson on Saturday, but we'll see what presents itself along the way. I'm in White Rock, New Mexico, staying with old friends Doug and Dotty. I've been here for a couple of days, now: a re-entry into the world of real beds and real showers and other people. I stopped in Santa Fe on Tuesday after I left Carrizozo and Valley of Fires and a long leisurely roll along US 285. In Santa Fe I re-arranged my data allocation for the Verizon Hot Spot, had lunch at Panera Bread, and filled the gas tank. The easy driving of the previous days yielded the best gas mileage I've had yet on this trip: 9.5 mpg. A while back I started to replace the faucet in the "kitchen" sink in the rig. That proved pretty daunting, so I contended myself with tightening down everything I could find and replacing just the handles (one had cracked.) As I was packing up to leave Carrizozo, I noticed a wet patch on the ground under the sink; something's leaking. Dang. Went inside and fiddled: in some positions of the faucet spout, there's a slow leak at the base. I tightened it and experimented with different positions, and found one where the leak seems to abate. I'll improv my way home with this, and then figure out how to do the real fix. I had thought I'd leave here today, head northwest past the Valle Grande caldera, and camp at Fenton Lake up in the high country tonight (Thursday.) The temps up there tonight will be in the low 20's, and I'd probably be boondocking. Possibility of snow when I'd be driving down an 8% grade to get out. I'm thinking I'll skip that for now! So I'm looking at maps and figuring out routes. Insight: I realized just now that I'm feeling like skipping Fenton Lake is some kind of failure. I said I'd go there, dammit! That's mildly foolish, of course. But it's an indication of what a project it is for me to travel this way ... going, as it were, with the flow, rather than following the plan. For other people this is about leaving things behind, to simplify their lives. De-cluttering. For me, this represents an opportunity for mental de-cluttering, which is not always gonna be easy. It's not all that onerous, but it does require attention. So I'm not sure about the days between now and Tucson on Sunday. I'll let y'all know: I think I'll have fairly reliable internet access along any of the possible routes. When I talked yesterday about upgrades and modifications, I didn’t talk much about one of the most important aspects of what I’ve done: power and communications. The first thing I did when I got the rig was replace the converter: the box that converts 120V AC to 12V DC, and which charges the coach batteries. The old converter was OEM equipment in 1999. It didn’t use the current methods of charging batteries in stages, and was pretty much destroying the deep-cycle marine coach battery. The new converter uses modern technology, and has kept the coach batteries ( I added a second ) in fine shape. The other early purchase I made was a power conditioner. This is a box which plugs in to the campground power outlet; the rig’s power cord plugs into it. This wasn’t cheap, but it protects the rig and its equipment from power spikes (lightning strikes?) and brownouts (all the a/c units in the campground fire up at once?) and other potentially problematic electrical events. It’s done its thing twice that I’m aware of: it detected low voltage and switched me off campground power, then when voltage was back to normal, it switched me back. If I’d been running a/c at the time, this could have saved me some expensive repairs. Instead, all I had to do was reset the clock in the microwave. When I added the second battery, I also added a 400 watt pure sine wave inverter, hooked directly to the batteries. This gives me a reliable source of 120V AC for electronics. I didn’t wire it into the coach systems: I simply plug an AC extension box into it and plug things like the lap top, the phone, the tablet, the video camera, the wifi hot spot, and the bluetooth speaker system into it as needed. Ironically, these are all DC-powered devices, but they run off chargers which need AC. I don’t have all of them plugged in at once, of course. Mostly. I charge them up overnight and run them on battery power during the day. When I’m in motion, I plug the iPhone and the iPad and the dash cam into the inverter power rather than the cigarette-lighter DC outlet in the dash. It all seems to work well. If you’re not familiar with this technology, it’s important to spend the extra money on a “pure sine wave” inverter; this will keep electronics and small motors way happier. 400 watts is MORE than enough for anything I’m doing. I did make sure that the inverter I got had a cooling fan which only comes on when needed… which so far has been never. Not only does this mean I don’t have to listen to a fan all the time, it also means that the unit consumes essentially zero power when nothing’s plugged into it. This is important while camping off-grid, when every ampere counts! The laptop and phone and tablet are the Apple gear I use at home. The phone is an iPhone 6 with 16 G (gigabytes) of memory; my service provider is AT&T. I was one of the original iPhone customers, which means I get unlimited data with my phone. Handy for email and for streaming media. In camp with a good AT&T signal like I have here at Valley of Fires, I run music from various on-line sources through the phone and then via a Bluetooth wireless connection to a Big Jambox speaker system. (I’m listening to NPR Morning Edition as I type.) After a try with T-Mobile as a data provider, I switched to Verizon this summer simply because of their superior coverage. What I don’t know is how much data I will consume when traveling like this. Verizon and most other vendors sell data by the gigabyte per month. My current plan gives me 5G per month. In a little over a week, being more abstemious than I’d like about data use, I’ve used about 2.5G. I’m guessing that I can do what I want — upload and view videos, for example — on a data budget of about 4-5G per week without stressing. If I’m on the road for 2 weeks in a month, that means about 8-10G per month. That’ll cost me about $80 a month, compared to the $50 I’m paying now. It’s worth it to me. It’s a half a tank of gas. ( I know, ouch!) Some people need their hair driers when they travel, or their coffee makers. I value the access to information and the ability to share this experience with others, given that I travel alone almost all the time. What do you do on a rainy Sunday afternoon? Among other things, you make butterscotch pudding! One of the things I’ve been thinking about talking about is a review of a few of the things I’ve done to make trips like this work. A few of them are obvious and very expensive: the repair work Buck’s people have done, for example. These weren’t really decisions: they simply had to be done, or game pretty much over. But here’s an example of a pretty simple thing which makes a bigger difference than I’d have thought a while back: a wooden cover for the cook top. This was way more expensive than it might have been, but worth every cent! The addition of about 5 sq ft of surface is huge! Although so far this trip I’ve been staying at places which have power, I’ve done several things in support of “dry camping.” The solar panel, the extra deep-cycle battery, replacing the existing incandescent bulbs with with LED’s. These added up to a good chunk of change: probably about $300. But they proved their worth during the trip to southern Arizona a month or so back. Holding tank is 2/3rds full? No way. In fact, for an hour or so after I drained it, its demented little readouts said it was completely full. The problem, I’m told, is that toilet paper gets stuck on the sensors. It’s not, er, sludge build-up. Anyone out there have a solution that works? Enough. Time to mop the floor. How’s THAT for camping excitement?! There was a time in my life when I wouldn't have appreciated this paved trail with handrails where appropriate. Now I do. Well done, BLM! I’m parked on a ridge overlooking an old lava flow — a “malpais” as they’re called hereabouts. If that sounds grim, it’s not. This morning before it rains I plan to walk down there. This is a “developed” BLM campsite called “Valley of Fires,” and so far it deserves its great reviews. I have a spacious almost-level site, electricity, water, and gangbusters ATT and Verizon service. There are clean-looking showers. There are individual trash cans and sheltered picnic tables. I’ll probably “hole up” here, reading and writing and walking about, until early Tuesday, when I head up to see Doug and Dotty near Los Alamos for a couple of days. What was supposed to be a brief stop in Deming wasn’t so brief. I needed to get a prescription refilled at Walgreens, which was a major production involving phone calls to my “home” pharmacy and the time zone difference and the fact that someone who needed to sign off on the transaction couldn’t be found. It got done; I just sat in the waiting area and cleared the 209 emails which had accumulated in the last few days. I went to WalMart, because I needed to restock on some food and wanted a broom and a windshield-cleaning tool to get the bug smears off at the end of the day. It was a “Super Wally” with everything you might ever want under one huge roof. And I have to admit it was just fine. That’s a major admission. In general, I’m not a WalMart fan. I don’t like they way they treat their employees, I don’t like their corporate politics. And in my experience, the stores are crowded and unstaffed and just mildly nasty. This was none of those. The staff were plentiful and friendly and helpful. They had everything. The selection of grocery items was at least as good as my home neighborhood Albertsons and Safeway, and the clothing and housewares and stationary departments I walked through has the same stuff I’d expect at Target. The store was big and clean and open. I got a tasty, nutritionally absurd, portable lunch at Burger King to snarf down while traveling and hit the road. Drove through the White Sands Missile Testing Ground… the longest, straightest stretch of road I think I’ve ever seen, with miles and miles of nothing and occasional discreet roadside markers identifying “Emergency Rendezvous Point 37/38/39 … ” with a red cross marker. Occasional side roads lead to clusters of small buildings. One had a sign saying it was a “small missile test facility:” A useful reminder of the seriousness of the enterprise that was once in full tilt here. This is, after all, where the first atomic bomb was detonated at Trinity Site near Alamogordo, developed at the Labs at Los Alamos where I’ll be visiting my friends in a few days. Scary stuff. I’m learning about styles of travel. I’ve been really happy at state parks and National Forest and BLM campsites. When there’s a fee, it’s usually more than reasonable: $9 per night where I am now. (That’s 50% off cuz I’m old.) $7.50 at Lake Roberts. I enjoy the comforts of electricity and water. It’s even better if, like here, there’s good cell service. None of them so far are crowded or noisy or scary. The people I’ve talked to are pleasant and friendly and if I needed help of some kind, no one would slam their RV door in my face. There are people around, but — over there. I’m learning that when it’s workable, I’d rather stay a few days rather than move camps every day. I make snarky remarks about whether this is camping. Doesn’t matter. Whatever it is, I’m enjoying it. I found my little portable thermometer and put it outside for a while, in the pre-dawn period which is generally the coldest part of the night, and — ta-dah! — 25º That’s cold! I’m not sure when this will get posted, since I’m not sure when I’ll get into Verizon territory again, but it’s sure different from Tucson weather! Not that Tucson is that hard to take these days. The day’s agenda is to pack up the RV for a day trip up the river to the Gila Cliff dwellings, stop at the “general store” which is apparently a mile or so up the road from the campsite entrance, and investigate the hot springs which are between there are the cliff dwellings. I’m leaving a tablecloth and a folding chair and a note on the picnic table associated with my site here, hoping that will keep someone from poaching it when I’m gone. I’ll try to get back here before the late-afternoon influx. We’ll see. This is when a “toad” would be handy. I have the process of de-rigging pretty well down by now: I’m guessing it’ll take me about 30 minutes to disconnect the utility umbilicals and stow the contents of the rig so they don’t bounce around on the road. If I think to, I’ll time it. NOT having internet access for a while is a lesson in how accustomed I am to having information at my fingertips. I wanted to look up the elevation of where I am. (6043) I wanted to see what the temperature is in Tucson right now. I wanted to download the next in the series of fantasy novels I’m reading. I’m fine with not being able to check my bank accounts for a while, and emails will be waiting for me in abundance when I “hook up” again. Breakfast. Oatmeal! A steaming bowl of porridge! Yeah! (Later… drove up to Gila Cliff Dwellings. Windy, steep, and very enjoyable drive. To get to the dwelllings, it’s a half mile of steep trail. Back on a circuit route: what goes up must come down. Achy back. Achy knees. Spent $5 at the Gila Hot Springs for a soak — helped a bit. Up and out tomorrow, headed for Carazozo and Valley of the Fires by way of Deming. I know that’s not what I said I’d do. I’ll explain. Next post. A quick note from the chilly dawn... pre-dawn, actually ... at City of Rocks. The next few days will probably go as planned up in New Mexico's Gila Wilderness area. But I've already had some new/old ideas about what happens after that. We'll see. A reminder that I'll be out of cell phone range for a few days, I expect. I'm taking pictures and some videos, and I plan on mooching internet bandwidth from Doug and Dotty in White Rock early next week to upload and share them. So far my internet use has been about exactly 1 gigabyte. My Verizon plan gives me 5. So I'm right about on target. I may increase my plan to 8 gigs, if this feels cramped. Off I go. I'm excited! The plan for the next few days is pretty much set. After talking to the volunteer at the visitor center and someone who lives nearby, the stretch of road that goes more or less directly north from Silver City is a Seriously Bad Idea. Really narrow, at time more like 1 1/2 lanes than 2, very steep grades, and scanty guardrails. 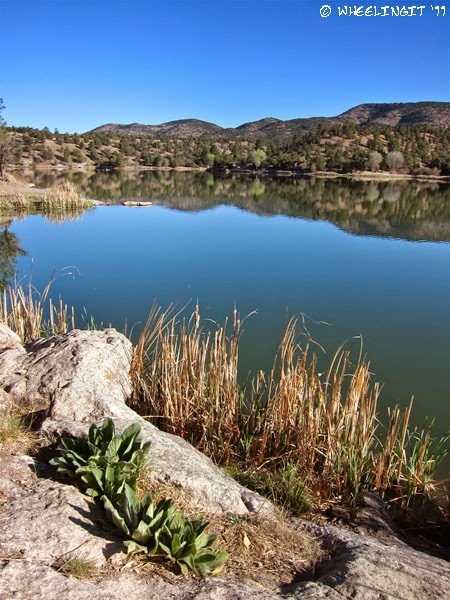 So I head direct to the Gila Cliff Dwelling area from here, with the plan of camping at Lake Roberts, with a Forest Service campground which gets great reviews. In the neighborhood are the Gila Cliff Dwellings, and a hot springs. I’m thinking I’ll plan to spend three nights there, but I may keep the rig in traveling mode so I can go do things during the days. I haven’t done this before, so it’ll be a new set of logistics. My eyeballs are getting pretty dried out from three days of dry wind. (Just remembered I packed some Visine. Ahhhhhhh!) If I spend three nights in that neighborhood (Thurs-Sat) I can still pretty easily get up to White Rock to see Doug and Dotty on Monday or Tuesday, going the long way back through Silver City and then north. Here’s a map segment which is the tentative route from here to White Rock. I'll go north from City of Rocks, hang out up in the Gila Wilderness for a while, then double back and go north through Silver City and Glenwood. If you’re following me closely, the area up near Lake Roberts has zero cell service. So you won’t be getting anything from me for a few days… not to worry. None of this is boondocking; there will be people nearby. I’m starting my second full day here at City of Rocks. The wind seems to have calmed down, but that may just be the early morning way of things. When I made this reservation a while back, my thought was that this would be a good place place to break with the rhythms of my usual living. A few days ago, as I played with alternate routes, I considered shortening this stay, so I could fit in time at other interesting-sounding places down the road. No. I’m enjoying my time here. Three nights was right. I need to get a clothesline. I need to bring along some clothespins from the stash in Tucson. I need some routine for dealing with cleaning clothes, like the sweatpants I spilled juice on. Grey water disposal. I’ve been surreptitiously dumping the dishpan on a friendly local cactus, rather than letting it flow into the holding tank for dumping later. I feel a little queasy about this… but it’s what I’d do if I was in the tent camping area down the path … maybe I’d feel better about it if I got some “biodegradable” soap. Dr. Bronner, where are you? Even though I have unlimited water and electricity, I still find myself turning off the lights. I’m aware, here, of limits. Limits of internet bandwidth. Limits of space. And even though I’m not doing this in search of simplicity, as I adapt to the limits of my living this way, the result is simpler. In short, I’m paying attention more. Spending less time on autopilot. Less time on line, more time watching the birds and the shadows move across the rocks as the sun moves across the sky. What would it be like to live like this all the time? Next stop tomorrow is Gila Cliff Dwellings nat’l monument. I plan to camp at Gila Hot Springs campground, maybe for a couple of nights. I had thought I’d go back into Silver City and then up NM 15 to the Gila area, but there are cautions about the NM 15 being twisty and steep. Hmm. There’s another option , which is actually shorter, given where I am now. I guess I’ll talk to one of the campground employees in the course of today. Second cup of coffee. Here I am… Day 2, 6:48 AM. This little park is pretty cool. Sites are level and spacious… when I look out my windows I see mostly rocks and desert. Mixed in with the bird sounds, however, are the signature calls of Little Yappy Dogs. When I was out taking some pictures, I met a guy with two of ‘em on a leash, headed back towards his trailer. His female traveling companion was calling to him … she didn’t sound happy. He didn’t look happy. The dogs, on the other hand, seemed delighted to be where they were, sniffing happily at every rock. Yapping aside, I think I’ll try to be a dog this trip and sniff as many rocks as I can. Some lessons learned so far: The hassle of climbing up and down into the sleeping area over the cab isn’t worth it, particularly when I’m traveling alone. The aluminum ladder from home helps, but it takes up space and is ugly. I think it gets banished to traveling on the roof ladder outside, along with the clean-out hose. It’s worth the minor hassle of converting the dinette table into a bed every night. At least, so it seems right now. The plastic folding workbench is a good idea. I haven’t needed it yet, since this campsite has a picnic table, which served very nicely as a place to park the little propane grill. When I get to some boondocking, I’ll see whether it’s worth the size and bother. This is a pretty roomy space, but I have to work to keep things picked up and put away. It gets real cluttered real quick. Like a tent. Or a boat. Things tend to expand to fill every horizontal surface, mostly because I haven’t yet fallen into a routine of what goes where when it’s put away. That will come. Yesterday afternoon, tooling along an unremarkable stretch of two-lane blacktop, I found myself grinning for no particular reason. That’s a good sign: more grins! No structure yet for the day. A little housecleaning is in order. for sure! Probably cruise around the area on my bike. Watch birds. Nap? Sure!!!! This will be short, both because I’m tired and because I’m trying to save bandwidth. As planned, I’m at City of Rocks state park near Silver City NM. Tomorrow I’ll take some pictures and edit some of today’s video. I'm not boondocking — there’s “shore power and “city water”… and it feels downright sinful to be having all these lights on! The Beast is running well: about 9mpg, and so much quieter and smoother than before the differential rebuild. It’s even earlier back home, but I’m truly bushed and headed for bed. Not easy to see. Cut lock cable. My grandmother called it "journey proud:" sleeplessness the night before a trip. I woke up at 2-something AM, and as I stumbled around the house, I discovered I'd packed all the coffee. So I walked over to where the rig is parked, and saw this. The braided cable and lock I'd used as part of the "system" to protect the bike on its traveling rack had been cut. The cut cable (and lock) were left on the ground beneath the rack. There was no evidence of tampering with anything else; the rig was untouched. I'll look more carefully when daylight hits. And I was concerned about security in Walmart parking lots! Back to sleep, if I can ... and now I have coffee for when I want to wake up. I'm going to leave this open as the day progresses, to document the final stages of getting ready to hit the road. This is largely for my benefit, to keep me from having to re-invent the wheel each time I go out. I filled the gas tank on Friday, at $2.099 per gallon. Got 8.7mpg last tank full, which includes some road trip and some around town. I'm hoping the new differential/axle may improve gas mileage. I filled the propane tank yesterday, at $3.37 per gallon. (At Buck's gas station. Never again! The people are great, but getting the rig backed in so the hose would reach the tank was a nightmare. Much more convenient at U Haul just around the corner.) Propane continues to be a giant bargain. Refill after last trip took 2.3 gallons. That's hot water, cooking, refrigerator, and some furnace use on a couple of cold mornings. Took an Uber down to the storage lot and drove the Beast back home; parked in the Church parking lot across the street. This way I have the little car to run errands, and can leave it here under the carport when I'm gone. Uber cost: $5.93 Score! Started the refrigerator. For a while it wouldn't catch, but then I remembered the trick: I light all the stove burners for a minute to get gas in the line, then push "go" on the fridge. Works like a champ. By this morning, the freezer was at about 0º and the fridge was in the green zone. I can start loading perishables into it today. Made a shopping list and went to Albertson's -- $108 for the better part of two weeks' food. I'm sure I'll have to re-stock along the way, and I'll surely eat out a little, but that's less than $10 per day. Checked meds: nothing runs out while I'm gone. Emma and I will be properly medicated all along. Fiddled a bit with the dash cam placement, and found an angle which works reasonably well with the camera mounted inside. 9:30: Took the bike over to the rig and mounted it on the rack. Took a load of frozen and refrigerated food to the fridge. Checked to see if the indoor/outdoor thermometer would work if I replaced batteries. Nope. Noon-ish: brunch at Denny's. Mistake. 1:30: Took more stuff to the rig; bike locks, soaps, bike cover, jumpstart cables. Fussed with cabinets. Organized hoses etc. How did I wind up with THREE blue/white drinking water hoses? Checked fridge temps. Spot on. To do at this point: last laundry/clothing organization. Organize toiletries, meds. Pull kitchen stuff like a saucepan. Organize cables and connectors and batteries for all the electronics: phone, tablet, GPS for tablet, WiFi hotspot for tablet and laptop. All the little pieces for the dash cam. The Jam box for tunes. Dang! Maybe it's time for a nap. It wasn't. Too much on my mental to-do list. Took a load of various things to the rig, and cleaned its windshield. Time to consolidate lists. 7:15 -- took Emma to her home away from home, got some dinner. I'm about ready to roll. Here's the latest. Subject to change. Remember that you can zoom and pan in this, to show more or less detail. It's your copy of the map, for now. Thank you, Google. I have very few fixed time points in this. I'm due to give a presentation in Flagstaff on the 18th. I have reservations at City of Rocks on the 9th. I've told my hosts in White Rock when I expect to be there. Other than that I can pretty much wing it. For the future, it seems worth it to try to avoid "appointments" in the middle of routes... it makes it harder to decide to stay a little longer at some unexpectedly interesting place, or to add new destinations. Cost: 1668 miles as the Google flies. At 7 mpg (conservative) 238 gallons of gas. At $2.25 per gallon, $535. It looks like this and the costs of food and campground stays will fit into my usual monthly expense budget for home. We'll see how it turns out, eh? Now a more mundane matter. Laundry. I'm at the point in my list-making where I'm thinking about clothing, and it has slowly dawned on me that this stuff will get dirty and smelly and ... and jeans take forever to dry! A quick foray into the inter webs gives me food for thought. Better stock up on quarters, huh? I promise. Pretty soon these posts will be from more interesting places. Part of my purpose here is to document getting ready for travel, and I'm working on figuring out the best way to show you what I'm seeing as I go down the road. Here's a short clip taken yesterday (Thursday) as I go to get gas and groceries for the New Mexico trip next week. As the initial frame will show you, I've cropped out the distracting elements and left the good stuff. Well, what will be the good stuff. It's Thursday. I leave Monday. Yikes! By now all the little pieces of equipment that I've been acquiring for this and future trips has arrived. The Beast is back from Buck's, minus the signature howl of a disintegrating differential. I'm making lists, with entries like "buy dog food!!!" The mail has been put on hold. I have a key-safe so friends can have access to my town home if they need to. Some decisions: For this trip, I'm not taking the "big" camcorder and tripod. The quality of images out of the iPhone 6 and the new little Action Cam is sufficient to document where I go and what I do. I still have to figure out how to mount the little cam for on-the-road footage. The trial run I did yesterday in the car shows some of the problems: dirty windshield, reflections. One answer is to mount the cam outside, and control it from inside via its WiFi connection. But batteries ... ideally, I'd like to just keep the thing on standby at all times and when I see something I'd like to record, push the big red button. I could run a cable out the window with power ... but then I couldn't use the weatherproof housing for the camera. If you click on (or touch) the text which says "no comments," a window opens up and you can enter a comment. Try it! Say hello! It won't look the same if someone else has already left a comment, but you'll figure out how to add yours. And now back to making lists. Many flaws. It's a learning experience. This was done in my car. Perhaps later today I'll out it in the RV when I take it out to get gas. The camera performance is pretty good. I'm giving it a B+ so far.